We are all familiar with magnetic materials, but not so much with what exactly ‘magnetic’ means. The magnetic moment, usually quoted as ‘m’, it is defined as the property that makes a material align with an external magnetic field. 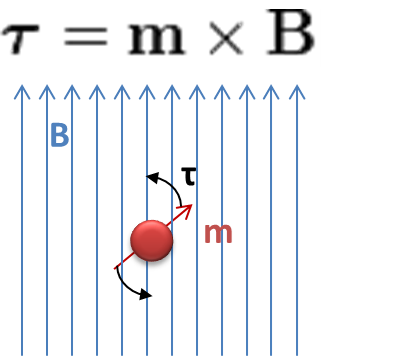 From a macroscopic point of view it is sources of magnetic moment: electrical currents (the movement of the electrons) and the presence of magnetic dipoles (magnets). The magnetic moment unit is the Am2 (International System) or emu (cgs). If we look at the atomic scale, the sources would be the electron movement around the atomic core and the electron spin (spin moment). The magnetization of the materials is measured by the magnetic moment per mass unit (Am2/kg, emu/gr) or volume unit (A/m, emu/cm3). When we apply a magnetic field, the electron movement will always oppose the magnetic change. Macroscopically, the phenomenon is well known by electrical engineers as induced current (or Eddy currents), and it decays once the magnetic field becomes constant. At the atomic level these currents are permanent. This kind of response is present at ALL the materials and it is called diamagnetism. As it is a very weak response(χ≈-10-7), it is masked when the atom/molecule has a net magnetic moment. The molecules having magnetic moment (angular or spin) have a positive response to an applied magnetic field as the domains align with it. This behavior is know as paramagnetism. However, because the magnetic alignment competes with thermal agitation, the susceptibility is small (χ≈10-6). In the materials we used to call ‘magnetic’ are the ones with a strong response to the applied magnetic field (χ>1000). In those materials, it is a molecular magnetic field due the interaction between electron moment, the so called Exchange Coupling. This quantum phenomenon is the reason behind the high spontaneous magnetization of the ferro- and ferrimagnetic materials. However, if we only take into account the atomic/molecular level, the overall magnetization of ferromagnetic materials would be 20 times larger than the highest value ever measured. The reason is that for macroscopic objects is is not energetically favorable to have all the domains aligned. That is why regions of different magnetization appear, called ‘magnetic domains’. The configuration and evolution of these domains are fundamental to understanding the macroscopic behavior of the materials of practical use such as permanent magnets, soft ferromagnetic materials, and magnetic recording media. The key parameter for these materials is the coercivity, Hc, which is the value of the applied magnetic field that makes the magnetization zero. That means that practical magnetic materials show hysteresis. 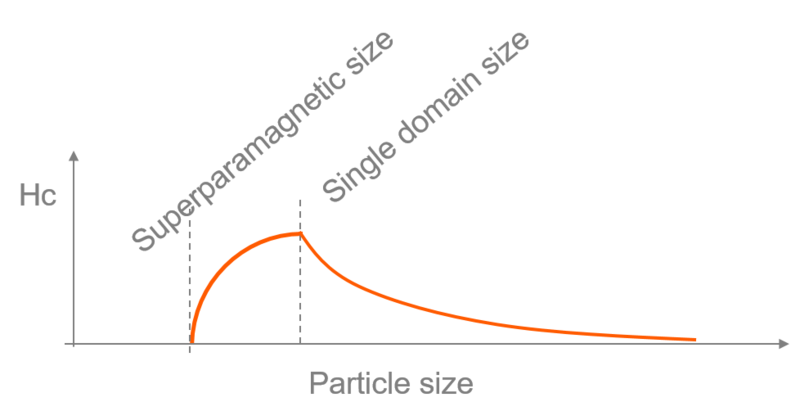 When the size of the particle reaches the single domain size it becomes very difficult to demagnetize. If the particle is still smaller, below the superparamagnetic size, the magnetization can freely rotate and the magnetization of the material is zero when the applied magnetization is zero. 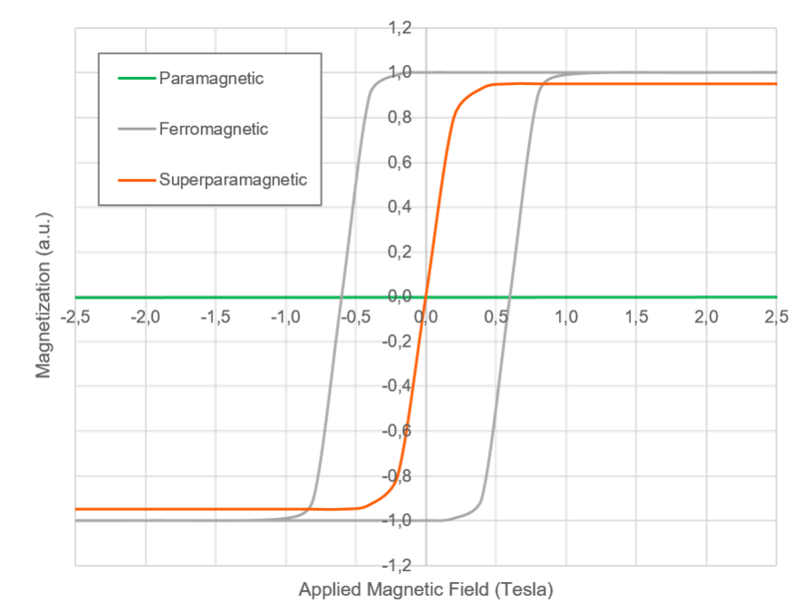 This special case of ferro/ferrimagnetic is what we call superparamagnetic and is the property of most of the biomagnetic separation applications.